You are here: Home / News / Stop The Invisible Lynchings In America. Stop The Invisible Lynchings In America. (ThyBlackMan.com) No form of lynching should be tolerated or permitted in America. 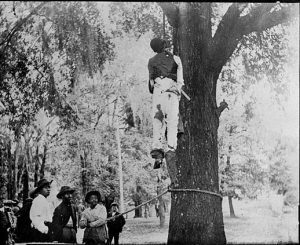 A lynching is defined as putting a person or a group of people to death by hanging a person or group with or without legal due process. However, in the no so distant past, the hideous act of racially-motivated lynching African Americans was considered legal, judicial and moral under state and federal laws. The Congress of the United States finally has a bill pending enactment that makes lynching a federal crime. We support this long overdue anti-lynching federal legislation. However, there are other forms of lynching that are still occurring across the nation, without due process of law and without a national public moral outcry. Why? Because today, some lynchings are invisible. There are no blood-thirsty mobs of people salivating their pleasures at the sight of a fresh Black body swinging lifelessly via a rope around his or her neck hanging from a tree or from the institutionalized gallows of history. On college and university campuses in too many states, what is increasingly happening should be called an invisible and insidious form of lynching. Disproportionately, young African male college students and others are being summarily expelled from college based solely on mere allegations of sexual misconduct violations of Title IX rules without any due process of law or findings of fact. College administrators are arbitrarily determining that these targeted students are guilty and expendable until their innocence is proven. This is not about guilt or innocence. This is about denial of due process. For thousands of the accused students the outcomes are fatal to their education and life goals. Currently, in the state of Missouri, there is important pending legislation (HB 573 and SB 259) in both the Missouri State House and Senate that seeks to stop and prevent these kinds of invisible Title IX-related lynchings from occurring at Missouri colleges and universities. In the past, lynchings were very visible. Today Title IX-related lynchings on colleges and universities are less visible, but this form of injustice must be exposed and challenged in Missouri and in every state. Equal justice and the constitutional right to due process should be afforded to all without regard to race, ethnicity, religion, gender or sexual orientation. This is the reason we add our voice and advocacy to encourage the Missouri legislature and all other state legislatures to stop Title IX-related invisible lynchings from occurring. Written By Dr. Benjamin F. Chavis Jr.